Product #45958 | SKU ARE-X2 | 0.0 (no ratings yet) Thanks for your rating! Restore power to your lithium-ion, NiMH, and Ni-Cd batteries with the ARE-X2 Dual-Channel Smart Charger from Fenix Flashlight. 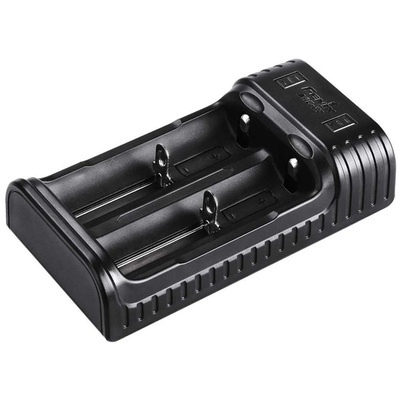 It's compatible with 18650, 26650, 16340, and 14500 Li-ion cells, as well as AA and AAA Ni-MH and Ni-Cd batteries. The unit features microchip-controlled, digitally regulated charging, as well as automatic mode selection. Its two channels work independently, allowing for simultaneous charging of different battery types. Additionally, with the ARE-X2, your batteries will benefit from protection against overcharging, over-discharging, short-circuiting, and reverse polarity. The unit runs on 5 VDC input power delivered via the Micro-USB port and included cable. Situated next to the Micro port is a full-size USB port, which can be used to charge other devices as batteries are being discharged. Only Li-ion cells can be discharged and used to power connected devices in this way.